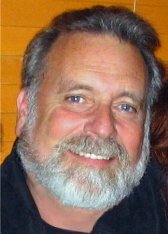 Skip Weinstock, Class of 1963 and founder of this website, was recently honored for his long and distinguished service to the Mt. Diablo Unified School District located in Concord, California. Skip has been a teacher in Mt. 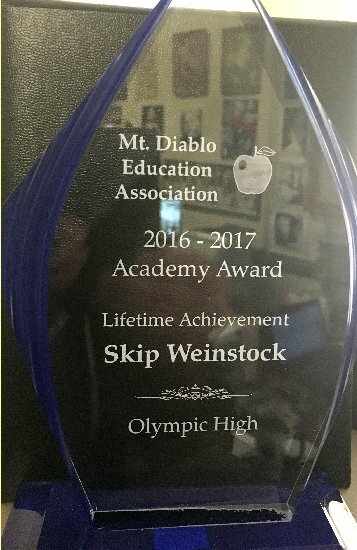 Diablo for the past 45 years, teaching at Olympic High School, a program that works with the most at risk high school students in the district. Each year the Mt. Diablo Unified School District hosts the Mt. Diablo Education Association's Academy Awards to recognize, promote, and celebrate the excellence of its employees and community members. Skip was presented with the Lifetime Achievement Award which recognizes a lifetime of positive service to the district. Skip was among several finalists and didn't know until the announcement was made that he had been selected. He was joined by his family, friends, and colleagues at the dinner ceremony which was held in May. Skip's remarks were captured on video and you can view them by clicking here.